I must admit I am not that big a fan of recent ES 175s or even the ones made in the last decades. The new ones look too fancy for me with all the flames and shiny finish. Besides, I played a few that really did not rock my boat tone wise. I do like my 1982 ES 175 a lot though. So I was curious how it would compare to the new VOS 175. The VOS 175 was a natural one with one pup. It's supposed to be historically accurate specifications wise. 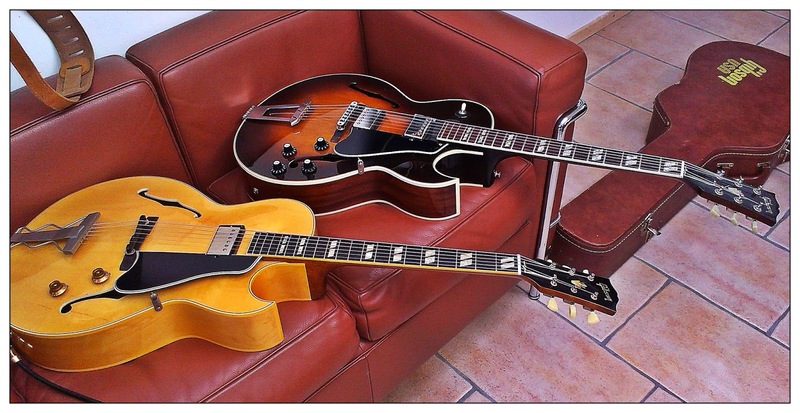 On the left you will see the original 1959 specs. The guitar looked and felt gorgeous. It was lighter than my 175 and more resonant. The tone was brighter though. 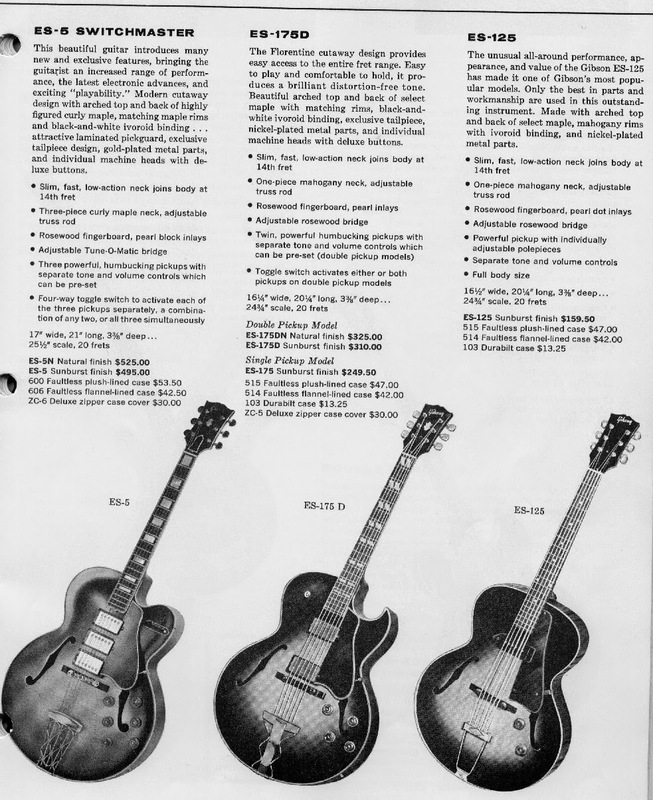 That is not suprising, my 1982 ES 175 has a mahogany back and in my experience the mahogany ES 175s sound slightly warmer and darker than the "normal" maple ES 175 guitars. Unfortunately the VOS 175 was factory strung with roundwounds (it was basically new) so that it felt different from what I am used to (flatwounds). I noticed the body of the VOS 175 was slightly thicker than on mine. We measured it and yes, the body of the VOS was about 2 mm thicker. 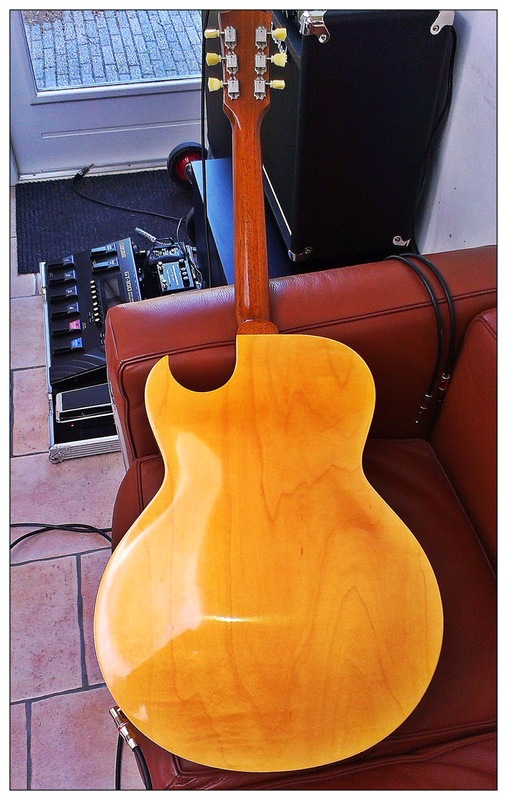 For a brand new guitar the VOS sounded and felt great. Much nicer than any modern 175 that I have played in a store. The VOS neck was a bit chunkier than on my 175 by the way. It was also made out of one piece, unlike mine. The maple woods on the VOS are very plain though and hardly a match for the gorgeous mahogany on mine. 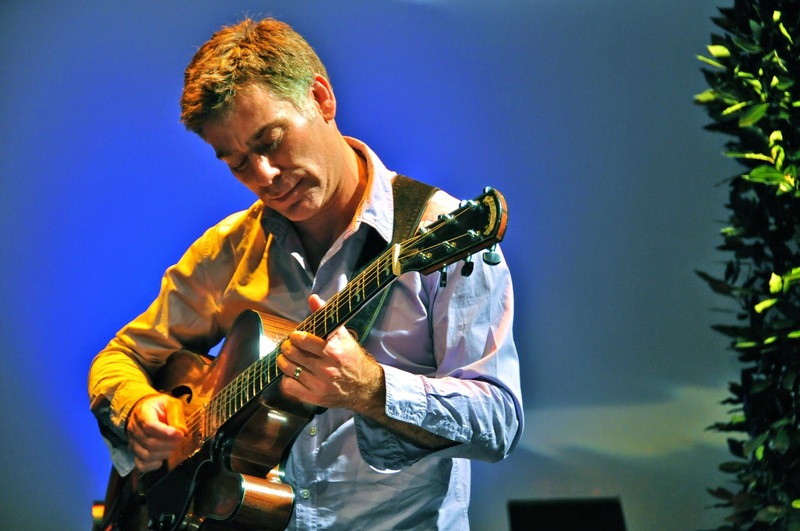 Is the VOS a better guitar than Joe? Not really. I have always thought Joe to be an especially fine specimen of a 175 due to the mahogany back and sides and quite frankly, I liked the darker, dryer and mellower tone of Joe a bit better. Also, I think the VOS 175 will feedback sooner. 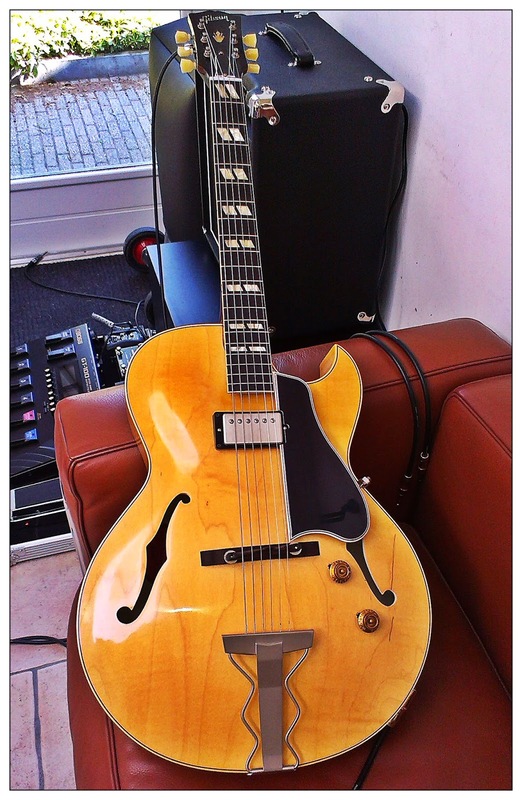 Due to its lighter construction with thinner plywoods it resonates better and sounds a bit louder unamped. But some will see that as a serious advantage of course! Still, the electric tone proved to be of a similar nature, only brighter and a bit more open. Sorry, no sound clips. I certainly would prefer a 175 of the VOS series to any other new ES 175 currently available and to the offering since the 90s even. It really does have a vintage vibe, both in looks and sound. It is more resonant and sounds a bit more open, just like older 175s often do.That it was brighter is no surprise to me, the mahogany ES 175s of the 1980s are especially mellow tone wise. I wonder about feedback issues for the VOS series though. Do I like VOS 175? Yes, very much so! Hardly the marketing trick I had expected it to be. The guitar really has a vintage vibe to it ... And looks and sounds just fine. However, the price tag is so hefty that you can almost get "the real thing" for it, so a real 50s or 60s one and there it goes wrong for me. For that kind of money I'd get a real vintage one probably. 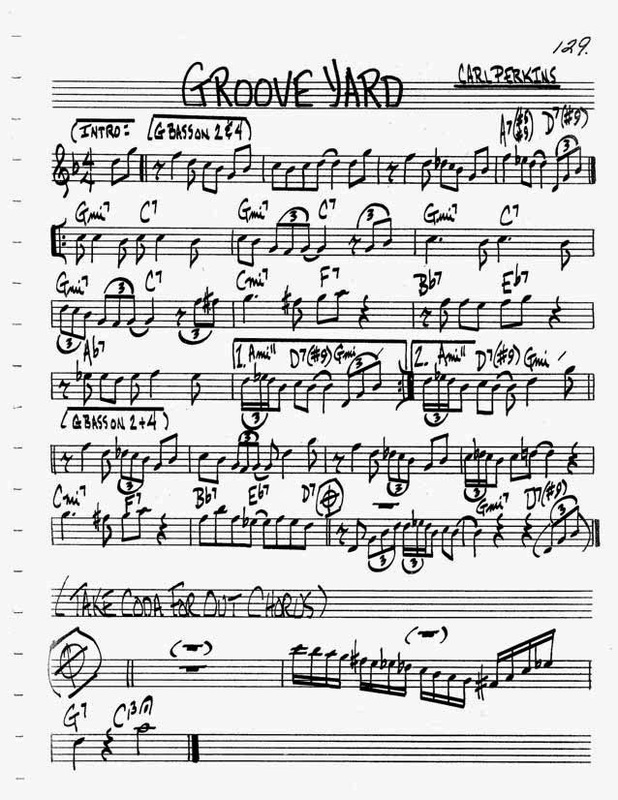 I have been playing Carl Perkins' "Grooveyard" for years now and still love it. Such a cool tune. Somehow it is not in the classic Real Book and it is absent from most other fake book as well. No Aebersold presence either. So I made my own backing when a friend - a great bass player - came over for a jam. Here's two videos. The first vid one is the full version with the head being played by me and with solos on guitar and bass. The second vid is a playalong. 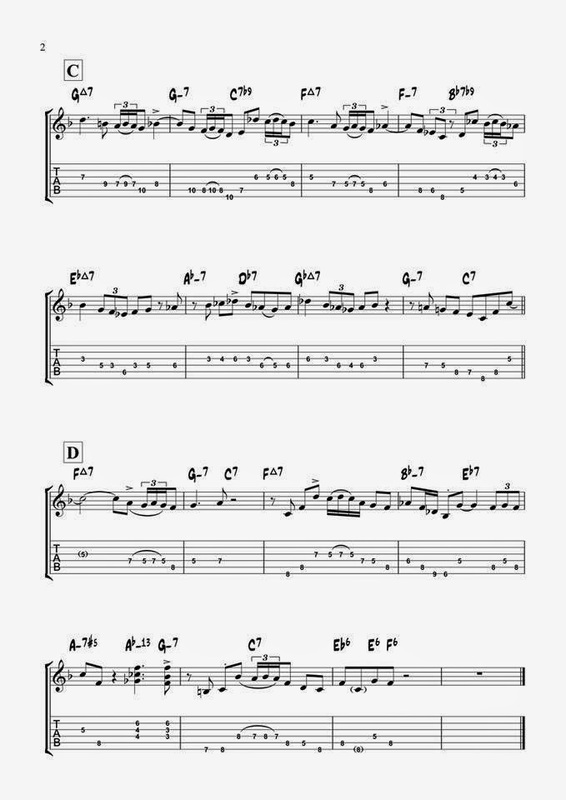 The order is: 1 intro (4 bars Gm7 C7 ) 2 head 3 your solo 4 bass solo 5 head and 6 solo on vamp out. 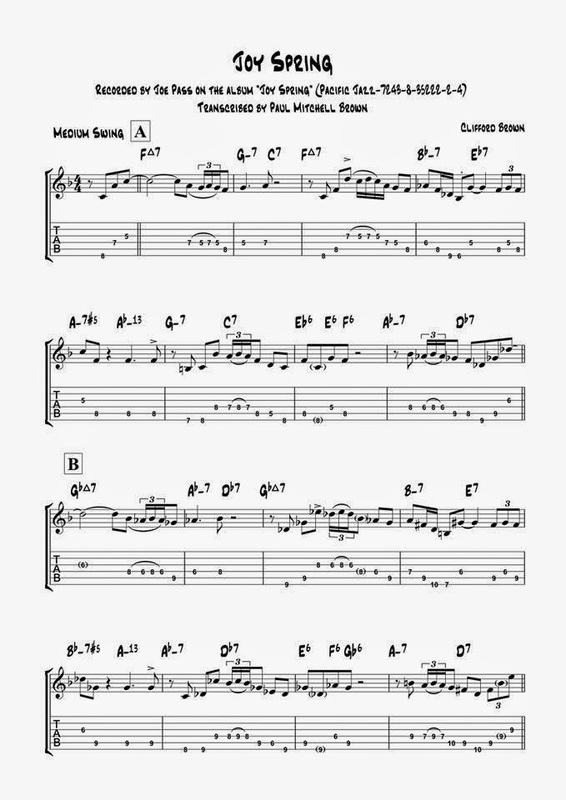 I do not start the tune with the pedal bass on 2 and 4 as in the sheet music. Thanks Bas for the great bass work! Have fun! 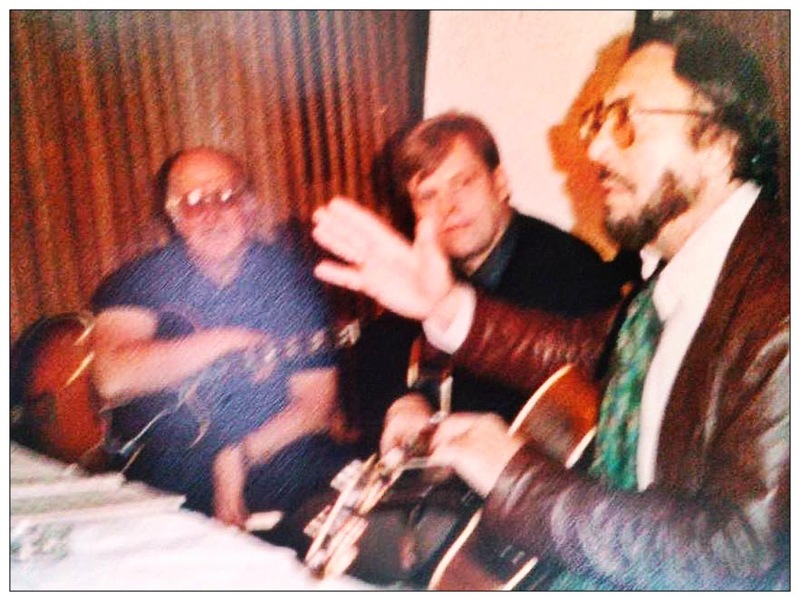 Back in 1986 Maurice Summerfield (Fretsonly.com and Ashley Mark Publishing) arranged a seminar to take place in Newcastle in the late autumn at which Barney Kessel would be the visiting celebrity guitarist. As a Barney fan, I signed up immediately. Later on in the year, two friends and myself decided to visit a jazz concert being held at a small country pub just outside of Grimsby on the East coast. When we drew up in the car park we could hear strains of an amplified guitar coming from the pub. When we got inside there were only about 20 people, both locals and some holiday visitors. Imagine my surprise when I noticed the guitar player was none other than Barney Kessel. He was in full flight playing his arrangement of "Brazil". I was dumbfounded -I sat about six feet away from him and was mesmerised. I managed to speak to him in the intermission and told him I had booked the seminar and would see him in about three weeks. He asked me various questions about how long I had been playing etc. when he took a quick non alcoholic drink at the back before the last set, which was about an hour. I spoke to him again at the end of the evening and asked him why he was playing in such a small place in the middle of nowhere. He turned to me, smiled and said "Why not?" Mmmm .... it couldn't have been for the money. The seminar was a great four days, with Barney teaching one on one, group playing, just great. Barney proved to be a nice, educated man who was at ease when talking, playing, and explaining. I never saw him again and was mortified when he died in 2004. Sadly missed Barney!